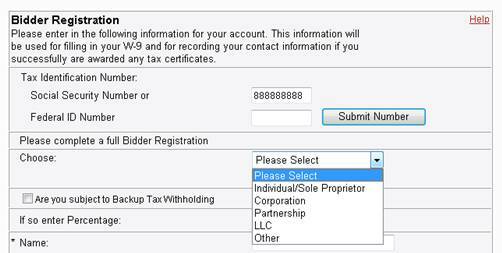 When registering to bid for the first time the Bidder Registration screen is the first screen. On this screen you must enter either a Social Security Number or Federal Tax ID Number. This information will be used for filing your W-9 and recording information if you successfully are awarded any tax certificates. The Tax Collector uses this number to report interest earned to the IRS. Enter your number and click Submit Number. If there is already a listing for the number you are entering it will show you here. If you have previously registered and wish to use this information you may do so, or you have the option to register with the same number and receive a new bidder number. Once you submit your number you will go to the Bidder Registration screen to enter the rest of your information. You first must choose which type you are filing under. If you are an individual filing with your social security number in most cases you would choose Individual/Sole Proprietor. If you choose LLC (Limited Liability Company) you must then choose which category you are in. Enter the name as you wish it to appear on the 1099. You may enter a business name but it is not required. You may also enter an in care of name but it is not required. Enter the mailing address. You must at least complete one line. Enter the city, choose a state, enter the zip code, and choose a country. Enter a home phone number with no spaces or dashes. This is a mandatory field. If you are a business enter the number again or enter a second number. If you wish to enter a fax line you may enter it also. 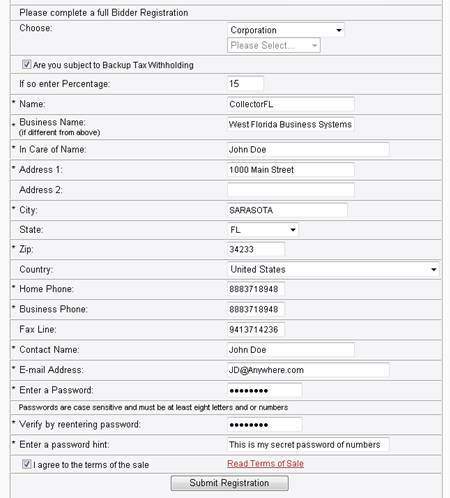 Enter a contact name and an E-mail address – these are mandatory fields. Passwords: Passwords are case sensitive and must be at least eight letters and/or numbers in length. Enter your password twice to confirm you are entering the same characters/numbers. REMEMBER keep your password and assigned bidder number in a safe place. Enter a password hint that will appear in case you forget your password. Read the Terms of Sale and click in the box. By choosing this box you are agreeing to the terms of the sale. Hit the Submit Registration button on the bottom of the screen. 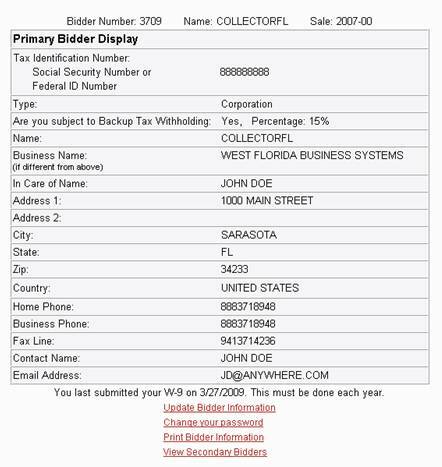 Once all the information has been submitted you will be assigned a bidder number for the sale. Remember; write down your bidder number and password. To print a copy of your registration information click on Print Confirmation at the bottom of the page. Once you have registered you must Submit a W-9. Choose Submit W-9. The W-9 information will be filled in. Type in your Signature and hit Submit W-9. Once you have a confirmation that the W-9 has been submitted you may print a copy and continue. You are now on the Primary Bidder Display screen.